I mentioned in yesterday’s Snapshots that Robert A. Heinlein’s struggle with tuberculosis is thoroughly chronicled in Patterson’s biography. In fact I got a little bit excited when I first read that my home town of Monrovia is the place Heinlein came for treatment in 1933, at a facility that once stood about 10 blocks from where I live. …the sanatorium cure was the gold standard for TB care, but that was really nothing more than rest in the fresh air, in a mild climate, and a reduction of physical stresses. Being…able to rest, and undergoing Dr. Pottenger’s tuberculin treatments brought about a rapid improvement. The Pottenger Sanatorium was at 600 N. Canyon Road in Monrovia. The hilltop property has since been developed for housing and now is known as the Canyon Crest neighborhood. Initially I thought that the old Pottenger place might have been just up my street on the property now used by the Maryknoll Sisters as a home for retired nuns. I’ve been inside many times on Election Day when it was the precinct polling place. That guess was proven wrong. While Maryknoll was once a sanatorium, it was not Pottenger’s. It was taken over in 1930 by the Maryknoll Sisters, associated with mission work in Japan, who use dit to provide care for Japanese afflicted with tuberculosis. I learned that before the Depression there were three or four sanatoriums in the area. Incidentally, the Heinleins arrived in Arcadia just a month before one of the biggest earthquakes in local history, on March 10, 1933. Welcome to California! 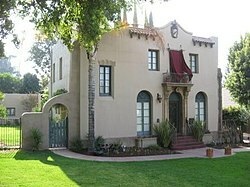 Upton Sinclair House in Monrovia, CA. This entry was posted in Reference Director! by Mike Glyer. Bookmark the permalink.